More than that, he somehow finds a way to tell the same story again and again, without ever blatantly retreading or recycling material. Most of Baumbach’s characters had a roadmap for how they wanted their lives to shake out, but the reality never matches their dreams. They have to accept the way things are to make the best of things. Each time out, Baumbach sheds new light on this journey, finding new ways to explore it, both comedically and dramatically. 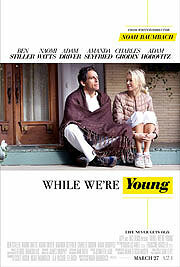 If there’s something missing from “While We’re Young” that you’ll find in Baumbach’s past films, it’s a well-rounded ending. There’s something muddled about the final exchange between Josh and Cornelia. Josh says something so naïve that one wonders whether he’s really learned that much. The character is a bit oblivious – and, to be fair, the broad statement he makes is subtle compared to his past behavior – but at first glance, his arc has been undermined or thrown off in exchange for a joke, albeit a very funny one. Perhaps Josh hasn’t progressed and, in some regard, is still very young. Whatever the case, it’s not as resonant or as impactful as the rest of the film. Baumbach’s stories are often strangely optimistic. The writer-director shows that people can change, no matter their age or their predicament. Baumbach tends to leave things on a hopeful – and more importantly, honest – note. The characters in “While We’re Young” are easy to root for, too, courtesy of a charming script and some endearing performances from Ben Stiller and Naomi Watts.